Our Tri-Tip Steak and Rib Rub for Sale 5 Oz is the collection and effort of focused development and research to deliver a customer specific multi-award winning BBQ. We planned to produce a product with just the right amount of smokiness, earthiness and spices but did not overwhelm the flavors of the meat. This dry rub uses key amount of salts, combined with balanced amounts of spices and peppers then layered with herb to produce an exceptional dry rub ready for the grill. Since we’re in the business of making and producing barbecue products we decided to consult our customers to find out what they really wanted when it came to steak, rib and Tri-Tip rubs. We learned that the most exceptional products are unique but simple in their presentation of flavors. Our customers wanted to taste the meat and then visualize the look of the meat with golden brown skin and crusts that were bursting with flavor. We gathered a focus group and used these key persons to test our results along the way. We can’t say those original dry rubs were good but what we can say now is that this Tri-Tip, Steak and Rib Rub is a definite winner. Imagine golden pure tasting steak and ribs. A finish that transports the mind directly to Western styled barbecues. That and more is what you get when you use this dry rub. The aromas are natural and not overpowering. Clean herbs and spices typify the results of this dry rub blend. The Vaqueros (Western Cowboys or Horsemen) would be proud over the end results of this dry rub. With our testing and with our consultation with many Executive Chefs and Pitmasters we found that the best steaks really don’t require all that much in terms of flavor enhancement. Our steaks require the minimum amount of marinating then the addition of a few key sprinkles of our best Tri-Tip, Steak and Rib Rub to deliver awesome flavor to Tri-Tip Roast. In cases where the meat is less tender we tend to add more shakes to get past the point where some meats need the help. But the end results are always exciting and flavorful. One of the key issues we tackled was does the dry rub transport well when taken on family trips and outings? The 5 Oz containers are right sized for anyone and any family. The store well and the ingredients are viable for 24 months (2 Years) from actual point of use. That means you can store them just about any place and take them just about any place, on camping trips, on house-warmings, as Christmas and holiday gifts, at the office, on long journeys outside the US and anywhere else you can think. This is Jake's 1st created BBQ Rib Rub for sale. Focusing as a design on creating a dry rub product with a Western style and an earthy, natural taste. We centered on our value of creating useful products that could be used each and every day. We knew that good barbecue starts with good cuts of meat and great barbecue is focused on the use and management of just the right amount of seasonings and BBQ rubs. Our Steak Rub Recipe Tri-Tip and Rib Rub for sale elevates the flavors of a barbecue creating a golden brown color accentuating the use of natural garlic, natural pepper, herbs like tarragon and oregano and smoked salts along with a special helping of brown sugar that works to compliment as well as enhance the overall flavor of the rub on the meat and the palate. Our best thoughts about this great steak and rib rub. 1. This is a natural dry rub that is healthier and more flavorful than store bought dry rubs. 2. There are no MSG or unnatural enhancers used in the making of this rub. And No chemical enhancers were used to drive the flavor of the rub. 3. Good on the grill, in the oven, or on your stove top. The rub is extremely a versatile which means it can be used on multiple meats and can be used in multiple conditions where other dry rubs might not excel. 4. The container has a versatile spoon and sift cap. The end result is control. You decide when and where and how much of the seasonings you would like to use in any one setting. 5. The dry rub has a shelf life of 2 years. Preservation is simple just store in your cabinet with all the other glasses and containers. There is no need to refrigerate the rub since the life of the product is 24 months. You can place it in a sealed bag if you feel the need. 6. The BBQ Rib Rub is not classically spicy and only uses black pepper in its base recipe just like restaurants. For best results we recommend seasoning your steak or ribs first then allowing them to rest for at least 30-45 minutes prior to grilling. We believe that 2 Tablespoons when sprinkled on to ribs or steaks will produce exceptional results; however, you may feel the need to load up on spices if you choose. Best results just like the differences in palates will be determined by the individual user. Ever wonder how to properly clean ribs before adding Rib Rub? See our best tips for creating great results below. We prep the ribs with our BBQ secret yellow mustard technique. You may not choose to use this technique, no problem just follow the process as you normally would and leave out the mustard. If you use the mustard let the ribs rest for at least an hour. Follow that by rubbing in the BBQ rib rub. After rubbing let the rub rest on the meat for an hour. Turn on your oven setting it to 350 degrees. Bring the rubbed ribs to the counter as the oven reaches temperature. Position the ribs in foil in a baking pan to allow for easy cleanup. Place the ribs in the oven and cook for two hours then remove and place on the stovetop. 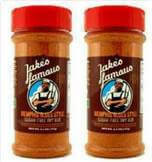 Open just the top of the foil and add your favorite BBQ Sauce such as Jake's Famous BBQ Sauce for Baby Back Ribs. You can cover both sides if you choose however, we will only be covering the meat side of the ribs. Bring the oven to 400 degrees as close to broiling without actual broiling and cook for approximately 15 to 20 minutes. Place the ribs on a rack at mid height in the oven. Allow the BBQ Sauce to caramelize on the ribs for about 10 minutes. At this point you can decide if you want the ribs to be slightly caramelized or if you like a heavy char effect. Once the sauce has charred remove the ribs and allow them to rest on the counter. Cover the ribs with foil or a towel for a minimum of 10 to 20 minutes longer if you can wait. Afterward you can slice and serve. 1. Prepare the ribs by removing the membrane on the curved side of the bones.Tip: Use a paper towel at room temperature to get a good grip and pull with a steady force. 2. Wash and dry the ribs then season with Jake's Famous Tri Tip, Steak and Rib Dry Rub seasoning. 3. Place the ribs in in a container and allow them to rest in your refrigerator for a minimum of 1 hours and not more than 8 hours. 4. Preheat your oven to 275 degrees. 5. Collect a baking pan and place a layer of foil in the pan large enough to cover the ribs. 6. After resting in the fridge remove the ribs and place them in the baking pan. 7. Add the cup of Juice such as Apple or Orange to create a steaming effect when baking. 8. Seal the ribs by wrapping the foil over the top and sides. 10. Drain off the liquid and hold aside. 11. Add the Honey, Mild BBQ Sauce, and Ground Thyme. 12. Collect the Honey, BBQ Sauce and Thyme with the liquid and reduce in a pot until a syrupy consistency is reached. 13. Use the sauce to cover the ribs. 14. With the ribs covered you can broil the ribs glaze onto the ribs creating a caramelizing effect by broiling for at least 5 minutes. 15. After the perfect slow cooked ribs are done allow the ribs to cool and rest for about 10 minutes. We really like the above alternate method for making ribs. We find that the natural dry rub penetrates the meat event raising the meat to its peak of flavor. In addition, using Jake's Famous Mild Barbecue sauce combine with thyme just exceeded our levels and expectations for a quality result. We also like this recipe because a general novice can easily make these ribs right in their own stove or oven. The ability to manage heat for a consistent time-frame is what wins awards at barbecue contests not to mention the seasonings and end taste of the meat. Be sure to bring the sauce to a syrupy consistency this is needed to aid in the stickiness on the ribs. It will also help in producing a candy-like coating that will make your guests raise their eyebrows one they taste the results. Also, focus on getting as good a rack of ribs as you can. When possible buy your ribs at the butcher counter as opposed to a flash frozen plastic package then the better off the results. Give this recipe a try as soon as possible..
Our BBQ Rib Dry Rub for sale does double duty: It adds a robust flavor and delicious crust while sealing in natural juices. Add this rub to your Cart and receive additional bonuses. And for a limited time you can get a 10% discount off any and all purchases from our site. Use Special Discount Code: Barbecue10 or 1707200910 at Checkout to receive your discount Now! Watch as Jake discusses our Tri-Tip, Steak and Rib Dry Rub for sale. Samuel Quick wrote : "I've tried many of the other Dry Rub for ribs already in the market, and they all had their pitfalls. But Jake's simple all natural recipe ticks all the boxes, it just works". JP Edmunds wrote: "Wow" what a fantastic Rib rub for my Tri-Tip barbecue. I've told all my friends about this delicious rub with just the right amount of smoke flavor. "Nice job Jake." Container sizes with sifter measuring 2" diam. x 5" high. Larger volume containers are available. Our Jake's Famous GUARANTEE is an exceptional barbecue experience. We will treat you better than friends and family and will work to deliver high quality products proven in the barbecue industry to create excellent results. If the results don't meet your expectations please contact us and we will honor our guarantee with replacements. See our products on Amazon. In addition to the above recipes there are some excellent recipes on our Tri Tip Dry Rub Recipe page. Gather the dry rub, follow the directions and produce some excellent tri tip. Get this exceptional Tri-Tip, Steak and Rib Rub Now when you Add To Cart. For Special pricing on multiple quantities of our famous Tri-Tip, Steak and Rib Rub click our Specials Link to be taken directly to the page.